Here’s what an ice dam is and how it gets created. Normally, it happens when we get snow. It doesn’t have to happen in the snow, but that’s when we see it most. If we get a storm that leaves 6” to 8” or more of snow sitting on a roof, and then the next few days are sunny but cold, those are perfect conditions. The sun slowly melts the snow and the run-off travels under the snow layer down to the eave (where your gutters are). The warm air coming from your furnace helps keep the attic warm and this also causes melting of the snow, however, when that melted snow reaches the soffit box, there is no interior heat to help keep the water from freezing. As the water reaches the gutter, it begins to freeze and with accumulation, that can begin backing up under the shingles. This process keeps repeating itself in a cycle: the snow on the roof melts because of sun warmth and interior heat, the water trickles down the roof and when it reaches the soffit where the eave and gutter is, it freezes and starts backing the ice up under the shingles. This can cause serious damage to the exterior and interior of a house. 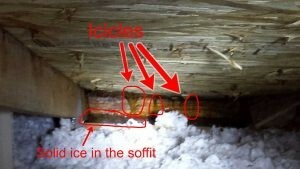 On the photo on the left, you can see what the soffit box inside an attic looks like that has an ice dam. I know that the photo is difficult to see well, but I have circled 3 icicles that formed inside the eave in the attic. In the box below the roof, which is the soffit box, that whole section is filled with a solid block of ice. Because of the warmth from the inside of the house, that ice slowly melts and can run down the exterior wall – as in the photo below and to the right, or worse, it can begin seeping into the interior walls of the house. What Can Be Done About These Dam Problems? There are two main remedies for ice dams: 1) acknowledge that the ice dams will occur and do things to prevent them from causing damage, or 2) install products that will eliminate ice dams. There are products that can be installed at the eaves, in the valleys, and along walls on roofs that will melt the snow and ice and try to eliminate an ice dam from building up in the first place. These can be very expensive or they can be not-so-expensive. The less expensive option is heat tape. This is a cable – about the thickness of the old coax cables – and its installed in a Z-pattern on the roof. I’m not a big fan of these because I haven’t seen that they work very well in really cold and snowy weather. The other option is a more expensive heating panel that covers a 20” to 36” tall area the entire length of your eave. These can be made to be installed in a valley or along walls, too. We are currently investigating a product that is manufactured in Denver to see if this is something we would recommend to our clients. It was recommended to me by a roofer in Steamboat Springs, where they have to deal with ice dams much more regularly than we do here. 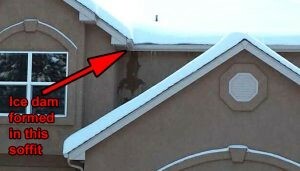 The typical approach here in El Paso and Teller counties is to acknowledge that ice dams will occur and try to prevent them from causing water to enter the soffit and/or the house. Pikes Peak Regional Building Department dictates that all houses that are over 7000′ elevation must have a product called ice and water shield installed at all the eaves around all heated living spaces. The ice & water shield must extend up the slope of the roof to a distance of at least two feet past the interior wall line (see photo). Teller county requires it to extend 6 feet past interior wall lines. This product doesn’t prevent an ice dam from forming, but it prevents the water from infiltrating the soffit because ice and water shield is a rubberized underlayment which seals around nails and staples and makes it more difficult for the water to follow a nail through the roof decking. What Do I Do If I Have Leaks In These Areas? It will always be best, if you have a leak, to call our office at 719-433-6991 and request an inspection. If you have a leak caused by an ice dam, it may be necessary to remove shingles and install ice and water shield. This should help prevent any future intrusion of water into your house or soffits, both of which can cause thousands of dollars of damage.